As the title suggests, the article highlights that the school has already saved $3,000 in electrical operating costs, which is approximately $70 per day. Director of facilities Doug Gorcak adds that the school has the potential to sell power back to the grid during the summer, depending on their output and consumption. The solar array is also a real-life classroom for students learning about solar power. 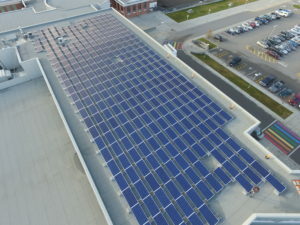 At Terratek Energy Systems, we’re excited to see BC schools adopting solar power (we’ve worked with more than 40 across the province installing solar electric and solar thermal systems). Many schools have also been able to access provincial grants and carbon tax credits to help fund the purchase. The Okanagan Skaha School District, where Penticton Secondary is located, is now seeking grant money to put an array on top of Princess Margaret Secondary.